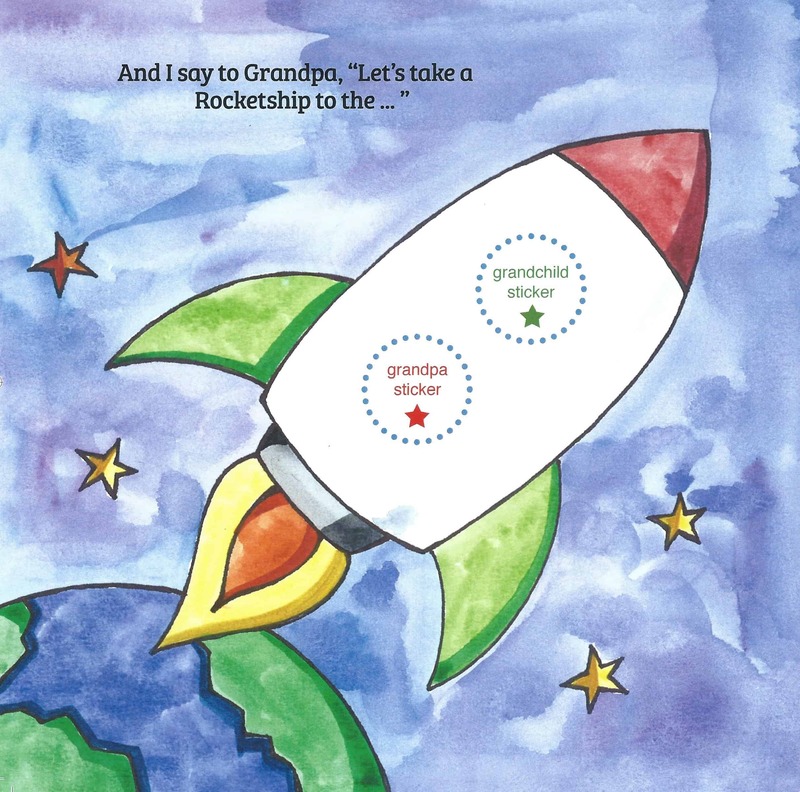 Inside: Grandparents are powerful influencers in the lives of their grandchildren. But wait! Are you a long-distant grandparent? Span those miles and get creative with your grandkids today! Here’s a fun way to connect with them—and build their brains at the same time. It’s personalized just for you and the grandkiddies! Have you ever considered the sobering fact that your “people influence”—those who listen to you, follow your example, and want to be around you, etc., —stretches to only two generations of family members? Your children and grandchildren…that’s it. Your great-grandchildren will associate you as a picture on a wall. You can write down your memoirs and possibly affect your posterity, but the real day-to-day impact happens with your kids and grandkids. However, being able to influence two generations is still a blessing. Think about it. Positively impacting and helping to mold people of two generations is heady stuff! Are you a grandparent? Do you have grandparents? Grandparents are enormous generation influencers and can transform the lives of those little people they adore…their grandchildren. My paternal grandmother, Grandma Peck was the saving grace of my childhood. She was gentle, sweet, and believed her grandchildren were brilliant and would someday walk on the moon. Best of all, she lived 15 minutes from our house. I saw her every week and spent several days with her during the summers. I have nothing but fond memories of this amazing influencer. My husband’s grandparents lived down the street from him, and he visited them every day. Mark had a very tight bond with Nana and Papa (as he called them) and was closer to them than his parents. They taught him many “firsts,”—fly fishing, pinochle, baseball, and a belief in God. But, times have changed. The nuclear family made up of extended grandparents, aunts, uncles and other relatives living in close proximity is no longer the norm. Today, many grandparents travel long distances and make great sacrifices to see their grandchildren, to be a part of their lives and to take on the role of influencer. Angela and Rick Blesi of St. Paul, Minnesota are long-distant grandparents to their grandson, Beckett. To stay connected, they created personalized books that incorporate photo stickers. 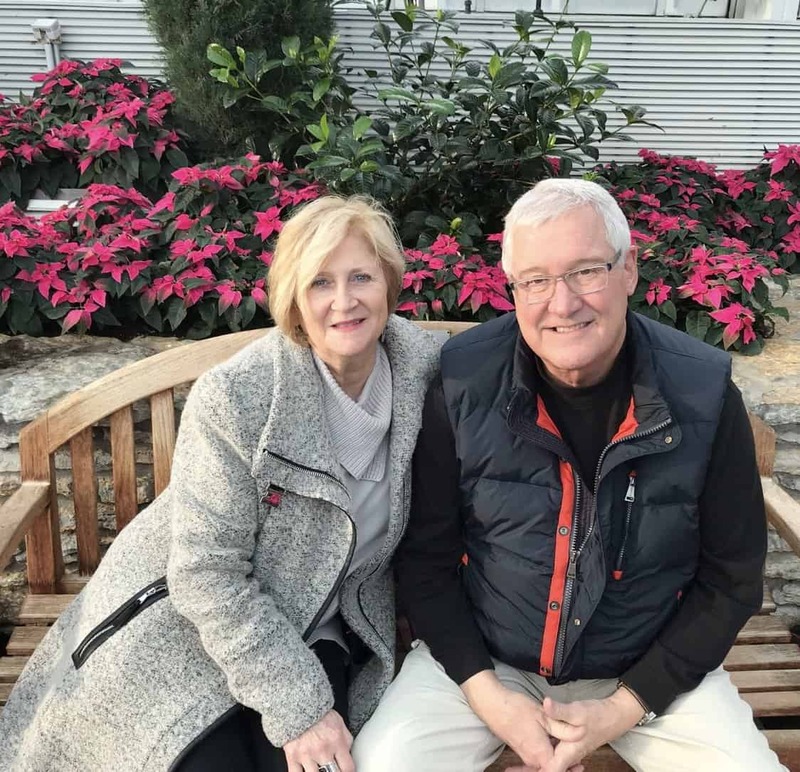 When the distance between grandparents and grandchildren is significant, many grandparents put on their thinking hats to come up with creative ways to be remembered by their grandchildren, and to influence them even when they can’t be near them. Most connect through texting, skyping, emailing, sending gifts, phone calls, and the list goes on. Angela and Rick Blesi of St. Paul, Minnesota are grandparents that love and cherish their grandson. Like many grandparents, they do not live in the same city as Beckett but make every effort to be there for him, even when separated by miles. They found that books and reading was a powerful way to connect, bond, and engage with Beckett and because of that, their book series, Sticking with Family® Books was created. It’s a long drive home from Madison, Wisconsin to St. Paul, Minnesota where the Blesi’s live. During this drive, Angela and Rick discussed ways they could keep in touch with their grandson since they only saw him four or five times a year. They worried that he would get so busy with other activities and friends that he would quickly forget the fun times he had spent with them. They put on their thinking caps, and an “aha” moment materialized! 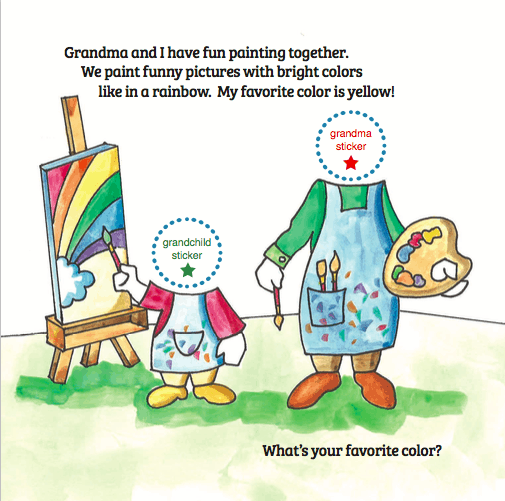 Angela came up with the idea of creating a storybook of grandparents and grandchildren doing fun things together. But the unique part was this: instead of random faces that most books have, they would create blank circles on the pages where the heads were located. Then they would make custom facial photo stickers of a grandparent and grandchild to stick there to personalize the story. They tested the waters with Beckett—they sent him a “mock-up” book with photo stickers and he was hooked! While his parents read him the story, Beckett put photo stickers of himself and his grandparents in the book. 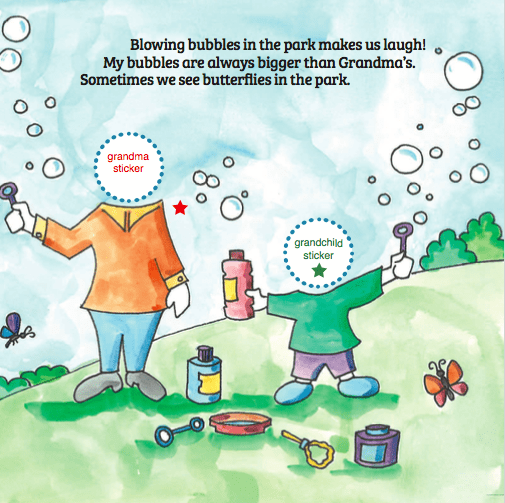 The Blesi’s knew that other grandparents were faced with the same dilemma they had—long-distance grandparenting—so they decided to create the sticker books on a larger scale. Surely other grandparents would like their own “Yester-Times” books to stay connected to those they loved. They hired a professional artist and illustrator, Kyle Frederickson and went to work. 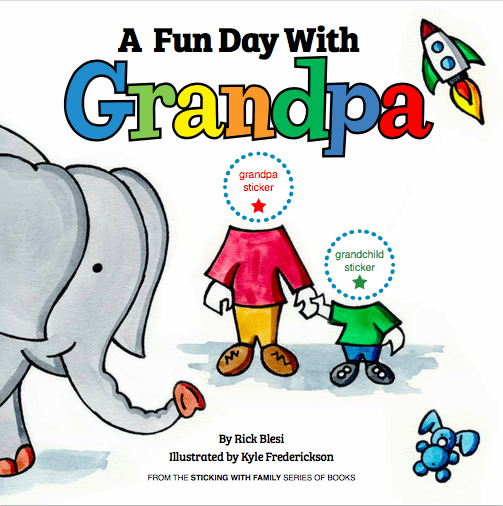 The result—two amazing books that are best described as bold, bright and beautiful: A Fun Day With Grandpa and A Fun Day With Grandma (and more in the making). 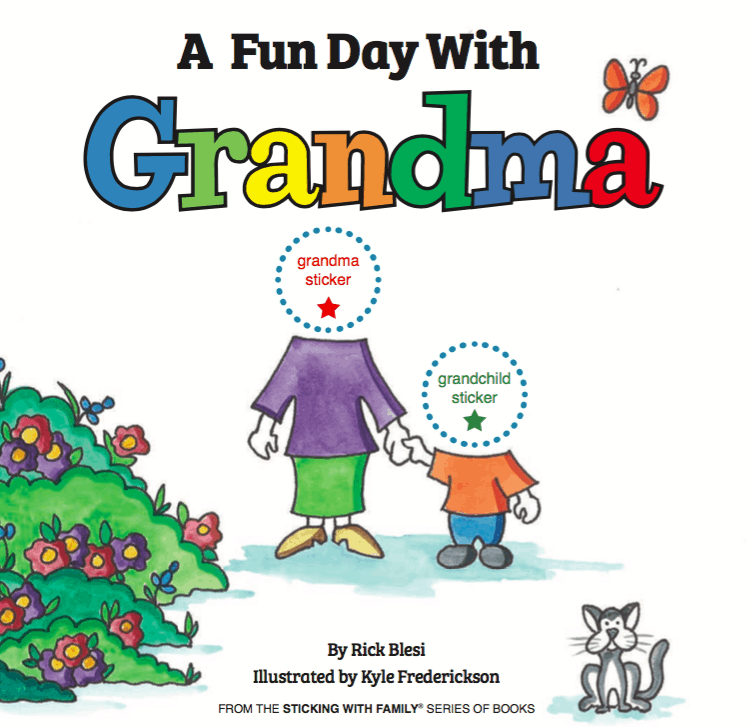 The photo-stickers make the book fun and interactive for grandchildren and help both grandparents and grandchildren to be connected even if they are miles apart! The Children’s Writers Guild loved the books and featured them in their November 2017 magazine. Why are these books totally different from other children’s books? Sticking with Family® Books create an interactive experience for an adult and a young child. The children create their own stories using photo stickers of their faces and their grandparents and end up with a personalized storybook about them and the activities shared together. There are many personalized children’s books on the market, but they are personalized with the child’s name, only. None of them use photo stickers of people’s faces. Think about this: you are reading a story to your grandchild about your adventures together. He is putting stickers of your face and his face on the pages. The story becomes a special memory and a connection that lasts forever! Every child dreams of getting on a rocket ship and flying to the moon! Now they can by putting the photo sticker of their face on the rocket ship along with their grandpa. These photos are used to create custom photo stickers that come with each book. Suggestion: try and upload photos where you are looking forward, straight into the camera. After placing an order, the website takes you to a Sticker Editing page where your photos (grandparent + grandchild) are formatted into a round sticker shape and uploaded to Sticking With Family. The photo stickers are printed (72 total) and included with the book and shipped to you within a few days. What makes these books so unique are the stickers on the faces of grandchildren and their grandparents. A fun and memorable gift! Grandparenting is just plain fun. You get the wonderful job of spoiling these precious kiddies. And you can influence them for good by instilling within them positive values and character traits through your example. Like my husband and myself, we fondly remember the influence of our grandparents. Likewise, Beckett will forever remember the efforts his grandparents made to develop and nurture a strong relationship with him. So much so that they even wrote books about their experiences together and are now sharing them with thousands! Rick and Angela Blesi will be my guests on Facebook LIVE! this Friday, February 16, 2018, at 10am MST. They will be talking about their books and more! 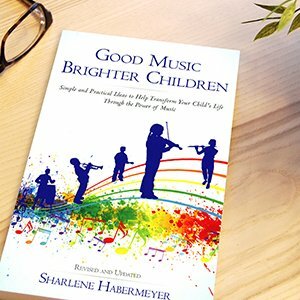 You need to join the closed Facebook Group: “Raising Bright Children” to see them. You can join here (it’s free, of course!) Don’t miss it! As a grandparent–how do you stay in touch with your grandchildren that live close by? What about those grandchildren that live in other states? What is your secret to keeping a relationship going? Please comment in the section below. « Kids: Dump the Tech & Try These 14 Amazing Brain-Builders! My grandparents were the best! They were a calming influence for our often disfunctional family. They were such fine examples to all of us. Your experience mimics my experience–wonderful grandparents (although my paternal grandmother was the best!) Grandparents are so important and can make such a difference in a child’s life! Thanks for sharing! I didn’t have Grandparents that were still alive when I was born. So I always dreamed of being a grandma. When that time came, jobs had taken our kids to other states. Yes we called, Skyped, and listened to them read to us over the phone. But then I started sending cards to them for every holiday. I wrote a special message to each child and included a few dollars to spend however they liked. They love it and so do I. This summer one of these families moved back. Now they are about 45 miles away. It is so fun to attend the school programs, dance recitals, vocal group presentations, Grandparents school day, etc. Now I feel like the grandma I have wanted to be. We have even taken out each child for their own special date. They are allowed to choose where we go to eat, and a present of their choice. They have surprised us in both activities with their choices. I think the most important thing to remember whether the grandkids are close or far away is to let them know you personally are proud of their achievements / interests and love them for just them! Great ideas Mary for staying close to your grandkids whether they live close-by or far away. I love your idea for sending cards with personalized messages at holiday time. They must love them and look forward to them with excitement! And being close by and being able to go to their school activities has to be the best ever for your grandkids. The important part is–and you’re doing it–is to do whatever it takes to build a strong relationship with people you love and cherish…your grandkids. Thanks for sharing! My grandma was like a second mother to me. I loved her with all my heart and think about her every day of my life. My mother had me in her early 20’s and I had my son, Zach in my early 20’s so she was still alive when he was born. Amazing, right?! I had professional pictures of my grandma, mom, myself and Zach together and I have them displayed all over my house. The best thing I ever did…Grandparents are amazing! What an amazing gift for Zach to have both grandparents and a great-grandmother when he was born! And those photographs on your wall will forever remind both him and YOU of how amazing grandparents are in a child’s life. I agree–like you–my grandmother was a very special person. I’ll never forget her positive influence in my life. Lucky us! I, too, think back fondly of Nana and Papa, and all the loving times we spent together. Mark talks about them all the time–they were a HUGE influence in his life and in the lives of his siblings. Thank you for sharing your memories!